In 1999, the Youth Violence Reduction Partnership (YVRP) was launched by a group of key stakeholders in Philadelphia -- including the district attorney's office, adult and juvenile parole, other city agencies and community organizations. Its goal is to steer young people, ages 14 to 24 and at greatest risk of killing or being killed, away from violence and toward productive lives. To accomplish this, YVRP provides participants with a combination of strict supervision and ongoing support. Each participant is assigned to a team that includes a probation officer and a community streetworker, who maintain intensive contact with the young person to make sure that he (and less often she) not only stays out of trouble but starts on a path toward responsible adulthood. Reaching Through the Cracks draws upon lessons learned from seven years of experience in Philadelphia to describe how cities and other jurisdictions can plan and carry out an initiative like YVRP. 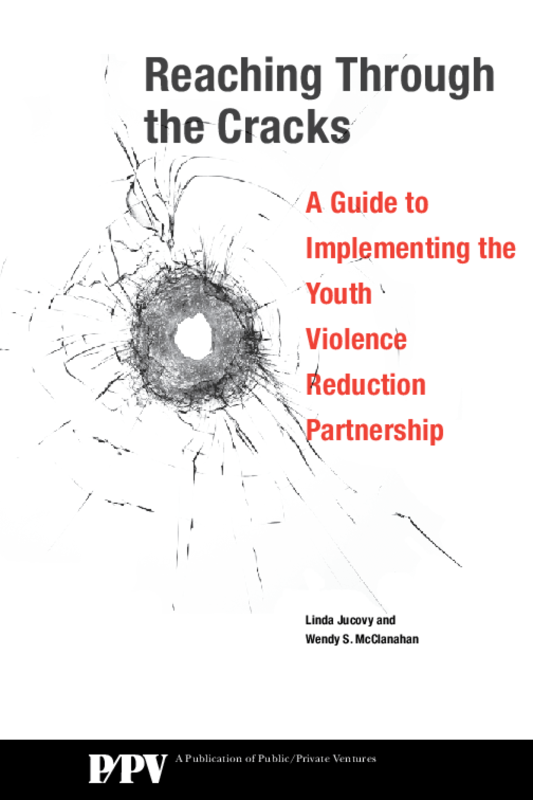 It includes an overview of the key elements of YVRP; steps in planning the initiative; roles and training of staff who work with the participants and details about the supervision and support these staff provide; essential practices for maintaining and strengthening YVRP; and an exploration of the costs and other issues involved in making decisions about expanding the initiative.